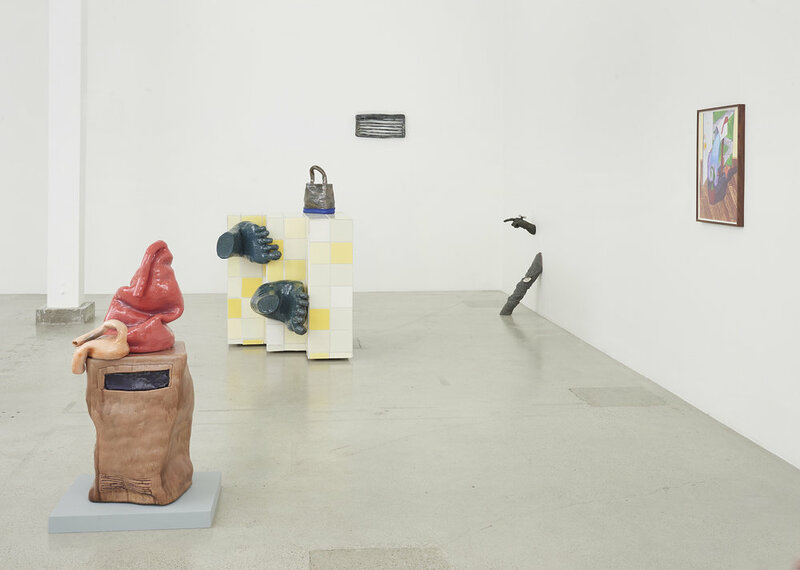 Jessica Silverman Gallery is pleased to present “Living Room,” a solo show featuring new ceramic sculptures and paintings on paper by Woody De Othello. 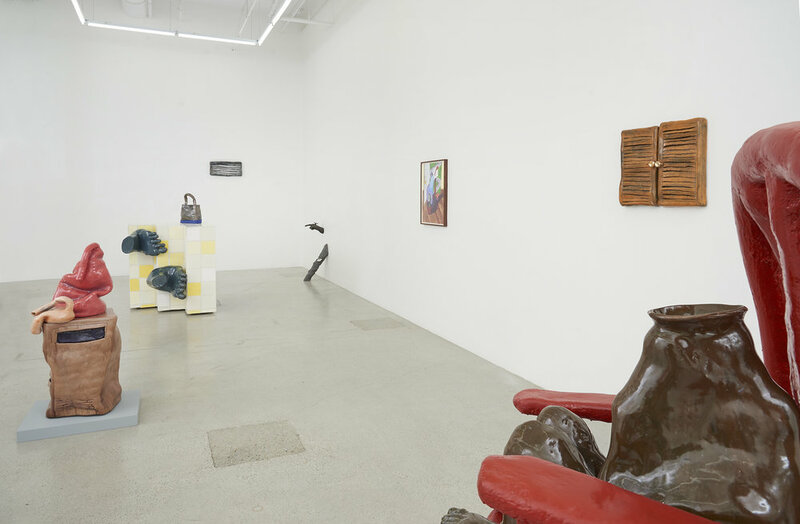 The title of the show riffs on a pun, referring to the central space of most homes, but also the idea of a room that is alive—a breathing, feeling, thinking, living room. Together the works in the exhibition explore the tension between the animate and inanimate, energy and exhaustion, hospitality and hostility. Othello’s surreal sculptures interrogate the genre of “still life.” Over-sized vases morph into torsos. A pink lung, a droopy ear and a gray telephone receiver slump on a boom box as if they are buddies supporting each other after a strenuous team effort. Despite their literal immobility, Othello’s characterful forms seem to listen, speak – or at least sigh – and certainly breathe. Other works depict a parallel universe of anthropomorphic furniture, potted plants, lamps, fans, and retro technologies. During his childhood, Othello saw these household objects as intimate presences, used to alter physical states and offer temporary comfort. Moreover, born and raised in Miami to a family of Haitian descent, the artist was enamored by the power of ceramic pots used to contain and overcome negative energy and bad spirits. Using a hand-building technique called “slab construction,” Othello builds his ceramic sculptures up about six inches at a time. “The clay takes over; it has a mind of its own,” he explains. 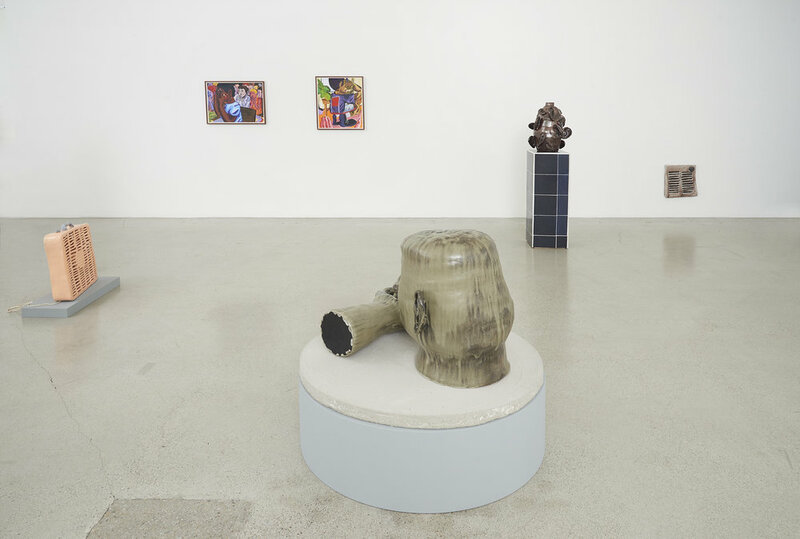 “It is a conversation and there is always space for me to react.” Othello pushes the forms up to a point where they are near collapse, working the unfired clay to a point of precariousness, giving each piece a psychological weight, a sense of movement and individual emotion. The glazes are then layered with many pieces being fired multiple times to achieve the depth of color and texture that Othello desires. These techniques are seen vividly in a work like Giving Up,which depicts a head and an arm with a clenched fist, both rest on a concrete slab. Othello has also created a site-specific installation with grassy green carpet and blue pinstriped “wall paper.” In the center of the room is a playful sculpture, titled Messenger, depicting a vintage TV set on a stout twisted wooden cabinet. Also on view is a suite of intensely colored, psychologically rich paintings on paper, depicting people in odd locations that suggest bizarre backstories. For example, in Self Support, a red chair is supported by a man’s legs, which, in turn, stand on a giant cupped hand. Woody De Othello (b. 1991 Miami, FL) completed his MFA at the California College of Arts in San Francisco in 2017. He received his BFA from Florida Atlantic University with a concentration in Ceramics. Othello has exhibited widely in Florida and the Bay area. His work is currently on view at the Akron Art Museum as part of the FRONT International: Cleveland Triennial and in “Bay Area Now 8” at Yerba Buena Center for the Arts in San Francisco. “Living Room” is his first solo exhibition with Jessica Silverman Gallery. Othello lives and works in Berkeley, CA.